Happy Wednesday! I'm Nicole and I am very happy to be a part of WOW family and share projects with you all! (You can read all about me here.) This is my very first project and I hope it inspires you today. My goal is to share very simple and easy ways to create awesome cards so you can always find a bit of time to craft in your busy life. 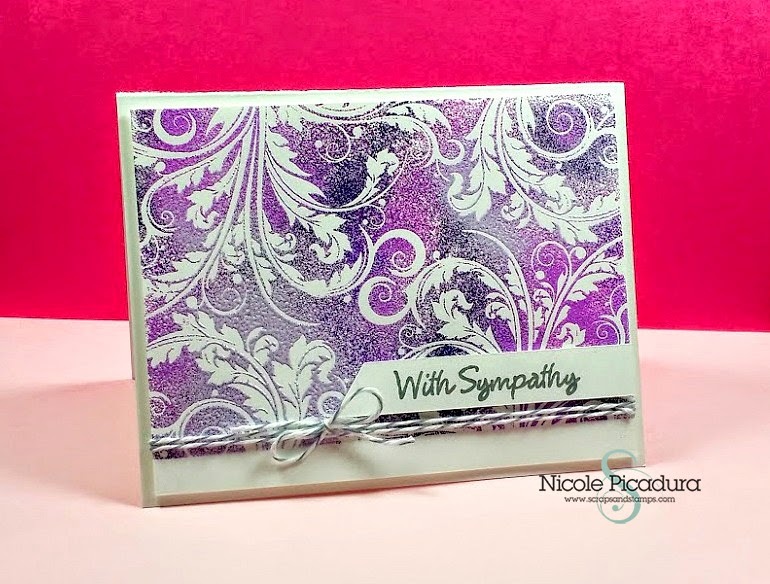 Today's card features a marbled coloring background using few different shades of purple. I stamped the background image by using the Brocade Stamp Set with Versamark Ink Pad. Then I took out few embossing powders and sprinkled bits of them here and there, so the powders would blend together. Colors I used are: Earthtone Grape, Primary Indigo, Metallic Lilac, and Metalline Violet. You will notice that each colors show different textures. I thought using different types of powders would create more fun texture, including those metallic powders to fit our theme for April. I love how fine these powders are where they show detailed background images clearly. Don't you love those awesome colors ? 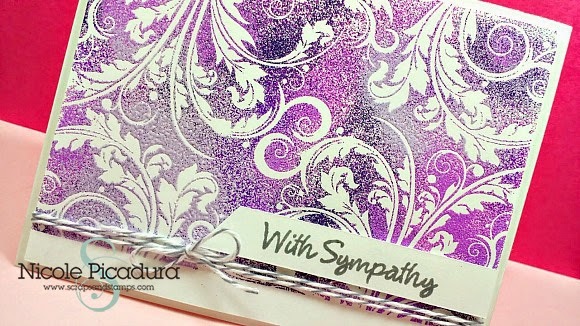 For a final touch, I wrapped gray/white backer's twine on the bottom of the layer and added the 'With Sympathy' sentiment from the Everyday Sentiments Stamp Set. I like to leave rest of the card really clean when showcasing a detailed, busy background. I hope you enjoyed the card as much as I did sharing it. Next time I will be back with a video tutorial so you can follow along in the cardmaking process. Thanks for stopping by and have an awesome day!